Team credentials: Alaska, Alps, California, Chile, Corsica, Costa Rica, Idaho, Nepal, New Zealand, Norway, Zambezi, (and now Turkey). Some considered our May dates for a trip to the Coruh to be suicidally early, especially coupled to the foreign office warnings about terrorist activity in the country. Luckily this meant we were guaranteed some big water and most of us felt much better once we had nominated an official hostage. The turks seemed to like pretty boy anyway, and apart from a quick game of `guess the age of the army colonel' and `name that machine gun' (a situation we somehow managed to escape from by waving the lone UK driving license we were carrying as ID and admitting that in fact we didn't have any maps with us) we didn't encounter any problems. River wise Turkey provides an excellent hard test for kayaking equipment. Running at between 300 and 500 cumecs in May the Coruh varies in colour from chocolate brown to silty blue. 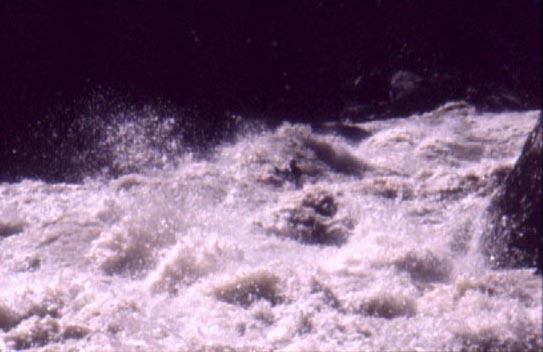 On the upper section there are several grade 5 falls interspersed with easier rapids. Below Yusufeli is 9km of quite continuous big, bouncy grade 4, large crashing waves, confused water, holes and haystacks. 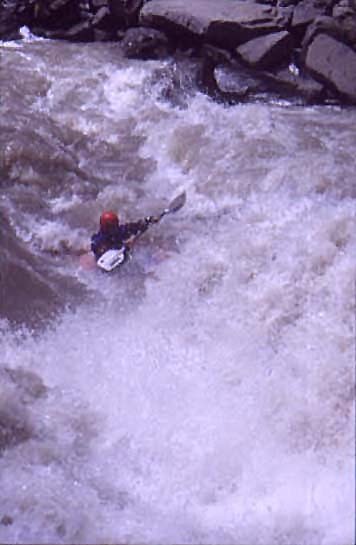 Further downstream is the largest rapid on the river, Lava East. Imagine 500 cumecs going over Otz falls. We tested 4 Dagger redlines and 2 Dagger infrareds, a set of Lendal manias and decks and drycags from DES.UK.COM. In all we paddled well over 200km of grade 4 and above white (or sometimes muddy brown) water. 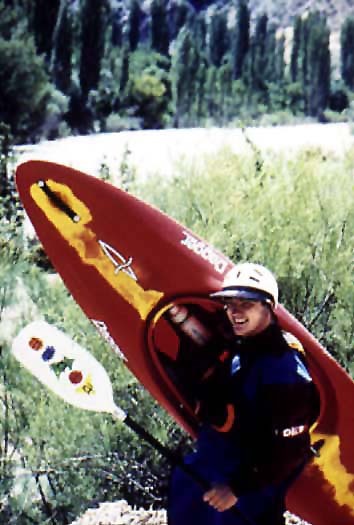 We believe this to be a severe test of both the design and construction of any kayaking equipment. Weaknesses in manufacturing or design faults would show up under these rigorous conditions. In practice none of the boats supplied displayed any sign of damage beyond the usual wear-and-tear. They felt surprisingly good in the big water, given that they were not designed with big volume river running in mind. We think that the basic hull design for both the boats is very good, although we would all have preferred the redline to be slightly narrower, allowing for greater forward speed and ease in rolling. Both boats are highly manouverable and very predictable and stable in big volume water, ideal characteristics for peace of mind and confident, safe boating. On the downside the fittings are poorly designed. This fact lets what is essentially a great pair of boats down significantly. In particular, the backrests are appalling, the strap itself is simply too thin, the buckle breaks and the bungy catches look prone to breakage and are fiddly to attach properly. We all found the seats to be far too wide, requiring large amounts of padding and think that modern kayaks really should have movable seats. Perhaps a `fit kit' could be provided for the buyer to outfit the boat correctly? Although the footrests and thighbraces were generally good, the footrest on the infrared leaves a gap underneath when shortened which could let a foot go underneath. There should be four retaining bolts on the footrest, not the two used as this arrangement allows the whole footrest to shift up and down. The foam padding on the footplate is too soft, suffering from lots of compaction. The drainplugs are in the wrong place, we all resorted to traditional sponges to dry the boats. Particularly at the end of a long day the boats seemed quite heavy and the plastic appeared quite soft, scuffing up very easily. Those of us with big feet found the fit a little tight and would have preferred more of the foam to be cut away to allow for this. Our most damning criticism revolves around the lack of airbags. It is the opinion of all of us that these are an essential safety feature and that they should be supplied as standard with a boat in this price range. We all bought airbags for the trip. Both boats scored highly on performance, with the infrared fairing particularly well, quite surprising given that neither boat was designed as a river runner. Both boats were let down by niggling concerns and the general feeling that you buy the complete package, not just a superb hull design. The Lendal Mania N12 blades survived all the rigours of Turkey unscathed. They felt very good in the big water, with minimal blade flutter (a lot less than that found when paddling with thin section paddles). Those of us converting from heavier blades found the lightness of the Manias a big plus point. On the downside we have a couple of minor points: the plastic material covering the handgrips is very slippery, especially when new. Several of us would also prefer shaped handgrips for both hands, ideally a shaped shaft rather than the insert. We understand that this would be difficult to achieve with the carbon fibre shafts and various allowable blade feathers but it would be our preference. 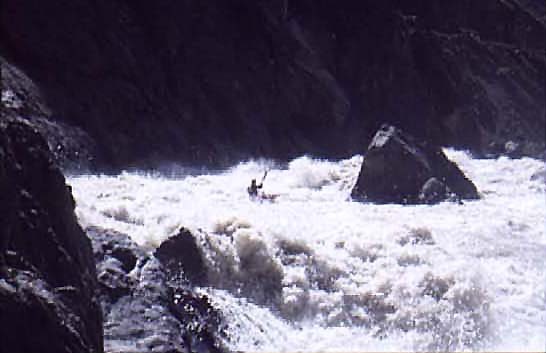 Two of us felt that the blade surface area was too large for big water paddling, increasing the risk of shoulder dislocation. This point is difficult to judge given the pleasant feeling of throwing lots of water on a technical river. The same paddlers thought that the blade shape appeared a little boring at first glance, belying how good the paddles actually felt. The blades scored well on performance and value and did exceptionally well on reliability. Everyone felt they could really trust them not to give out at an awkward moment, a major plus point. We tested a variety of DES full and semi drycags. Both types held up well with no apparent increase in water leakage over the trip. The semi dry version (with a neoprene only neck rather than the combination latex/neoprene of the full drycag) produced less cag rash from the silty water and only suffered additional water intake on severe poundings. The drycags performed very well, allowing plenty of freedom of movement, although the extra material that allows this made the cag feel baggy for some. People are a variety of sizes and finding a single cut to fit all is difficult. They scored well across the board, achieving a mark close to that obtained by the paddles. We used DES decks, a corded neoprene type with a single front centred escape tag. They proved to be rock solid throughout the trip. Despite the massive water and several comments of `boy I thought the deck would blow then', none of them ever did. Hugely reassuring all of us stopped worrying about deck implosions, often a constant nag when running large drops on continuous rivers. The decks got the highest marks of all the kit we took to Turkey, definitely a recommended piece of equipment. Each team member was asked to independently rank the equipment on a scale of 1 (useless) to 5 (perfect) in four categories. The averaged results are shown below for all the gear we took.